Kevin Huizenga (1977- ) grew up in the suburbs of Chicago. He began drawing comics in high school, xeroxing the first one (with friends) at the neighborhood Jewel Osco in 1993. Since that time he has self-published many comic books. 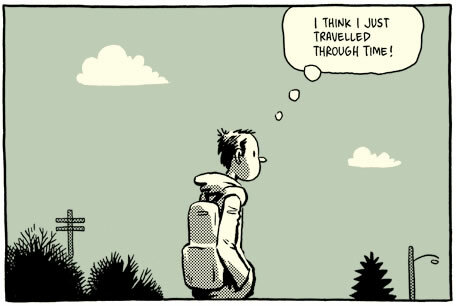 In 2001 The Comics Journal named him ‘Minimalism Cartoonist of the Year’ and called #14 of his Supermonster mini-comic series “one of the best comics of any kind released in 2001.” He started the online shop for mini-comics, USS Catastrophe, which is now run by Dan Zettwoch. His work has appeared in his Or Else and Ganges series, as well as a number book collections. He lives with his wife, Katie, in St. Louis. In a collection of short stories Kevin Huizenga fuses the most banal aspects of modern culture with its most looming questions. 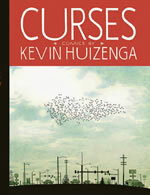 Huizenga’s central character is Glenn Ganges, a seemingly middle class man living in the suburbs whose blank-eyed wonderment at everyday experiences brings together such diverse aspects of our world as golf, theology, late-night diners, parenthood, politics, Sudanese refugees and hallucinatory vision, into a complete experience as multifaceted as our own lives. Curses collects Huizenga’s work from Kramer’s Ergot and The Drawn & Quarterly Showcase, his award-winning and nominated comic book series Or Else and Time Magazine. In The Wild Kingdom, Glenn Ganges blindly interacts with the nature of his suburban neighborhood: dead house plants; a recipe for grey squirrel brain; and pigeons eating discarded french fries in the parking lot of a fast food joint. Huizenga juxtaposes Glenn’s ignorance of his surroundings with television commercials highlighting society’s needs for cure-all pharmaceuticals and ‘hot new things’ like teeth whiteners. 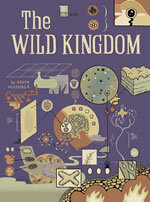 Starting off wordless, Wild Kingdom grows more complex page-by-page, ending with encyclopedic entries, biographical excerpts, anthropologic flow charts and a cataclysmic encounter of nature and technology. The Center For Cartoon Sudies located in White River Junction, Vermont, USA, offers a college-level education to budding cartoonists through intensive one and two year courses of study. Students become proficiaent in several areas including illustration, design, computer applications and writing. With an emphasis on self-publishing, CCS students not only make books but explore ways of marketing and distributiong their work as well. The CCS has become a unique community of young cartoonists who challenge one another to make great comics. 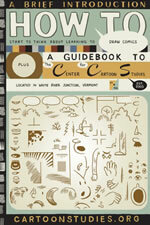 Enrolling at CCS means embarking on a course that puts cartooning at the center of your life. Is cartooning the right career for you? In a free downloadable pamphlet, Kevin Huizenga provides a brief introduction about how to start to think about learning to draw comics.